Amazon has been proudly showing off their iPad app today and made it clear they’re looking to develop for tablets as a category. Since there’s really only one category of Apple tablet-esque devices, it’s safe to assume devices like the HP Slate, and possibly, hopefully, Android tablets, will also be blessed with a big-screen and finger friendly version of the Kindle. Compare this to the iBooks app, which, if it has any portability at all, will most likely only move between the iPhone and the iPad, and possible on Macs. If you had to tie your data up in a proprietary store, which would you choose? The one that lets you be platform agnostic, read on eInk, small devices, big devices, tablets, computers, all with near-seamless wireless sync, or the store that ties you deeply to one ecosystem? Amazon’s potentially brilliant business model is that they are able to have a closed, controlled system and still offer flexibility and choice. This is similar to Kobo, though they offer this on a much smaller scale and don’t have the added benefit of an ebook reader they control into the mix. And this would apply to B&N if all their books synced across all their programs — to the best of my knowledge they do not. This bridges the major problem with ebooks right now; everything is very silo’d and the DRM is not generally interoperable. Your content from Amazon lives in one silo, from B&N in another, from iBooks in a third, etc. As a consumer, you really only have a few options: Bet the farm on one DRM plan, hedge your bets with a toe in a few different waters or buy only DRM-free books. Betting on one store is risky, and doubly so when your books are locked to both a store and a device. Hedging with several stores is a pain to track, and requires either several devices or one multipurpose device. And while DRM-free offers loads of flexibility, the content is thin. With a strategy that spreads support for the same DRM across multiple devices, you at least gain some modicum of flexibility within one silo. There’s always Adobe’s Digital Editions DRM, arguably the most widely used version. 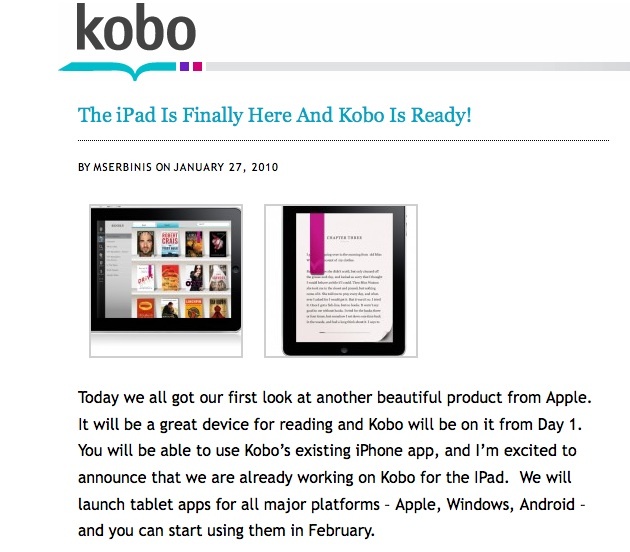 If you’re committing to that system, then Kobo becomes the best option; yes, your data is still stuck in one DRM format, but Kobo gives you the widest flexibility to read your books across multiple platforms (and they have an iPad version ready as well). Similarly, if you value ebook reader-tablet-computer-smartphone sync, your best bet is Amazon. Either way, the idea is to keep your data moving freely between multiple devices across platforms and manufacturers. My question, then, is “If content is king, why buy content that’s tied to a single device?” Hopefully, Apple agrees, and quickly approves Amazon and Kobo’s apps. We’ll find out soon enough!